The National Trauma Data Bank for years 2010–2014 was queried for pelvic fractures by ICD-9-CM codes. Exclusion criteria included age ≤ 17 years, penetrating injury, or incomplete records. Patients were divided into three cohorts: pelvic fracture, pelvic fracture with GU injury, and pelvic fracture with GU and GI injury. Between-group comparisons were made using stratified analysis. Multivariable logistic regression was used to determine independent risk factors for concomitant GI injury. In total, 180,931 pelvic fractures were found, 3.3% had GU, and 0.15% had GU and GI injury. Most common mechanism was vehicular collision. Injury severity score, pelvic AIS, and mortality were higher with combined injury (p < 0.001), leading to longer hospital and ICU stays and ventilator days (p < 0.001) with more frequent discharges to acute rehabilitation (p < 0.01). 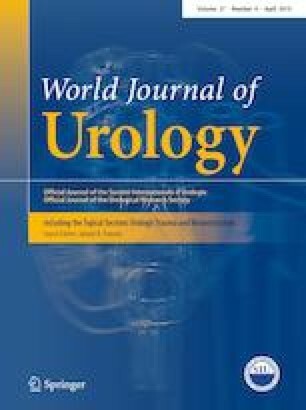 Surgical management of concomitant injuries involved both urinary (62%) and rectal repairs (81%) or diversions (29% and 46%, respectively). Male gender (OR = 2.42), disruption of the pelvic circle (OR = 6.04), pubis fracture (OR = 2.07), innominate fracture (OR = 1.84), and SBP < 90 mmgh (OR = 1.59) were the strongest independent predictors of combined injury (p < 0.01). Pelvic fractures with lower GU and GI injury represent < 1% of pelvic fractures. They are associated with more severe injuries and increased hospital resource utilization. Strongest independent predictors are disruption of the pelvic circle, male gender, innominate fracture, and SBP < 90mm Hg. This paper has been presented as a poster at the AUA VA Forum in San Francisco 2018, and it has not previously been submitted for publication prior to today. The online version of this article ( https://doi.org/10.1007/s00345-019-02725-7) contains supplementary material, which is available to authorized users. Committee on Trauma, American College of Surgeons, NTDB version, Chicago, IL, 2015. The content reproduced from the NTDB remains the full and exclusive copyrighter property of the American College of Surgeons. The American College of Surgeons is not responsible for any claims arising from works based on the original data, text, tables, or figures. NV and RJaF developed the project and wrote the manuscript; RJoF helped in project development, data collection and management; SK contributed to data collection and management and data analysis; MAB developed the project and wrote and edited the manuscript. This is a retrospective study, conducted on already available data. It did not necessitate IRB approval at our institution. Separate informed consent was not necessary as data are obtained from a national repository in a de-identified manner. The authors attest that this article does not contain any studies with human participants or animals performed by any of the authors.